After the Austrian Grand Prix the whole world was talking about Ferrari. The pygmies of New Guinea were discussing it over roast missionary: in Fiji there were drinking their cava and talking about Ferrari with their tongues numbed and even in the bombed out ruins of Afghanistan warlords were tuning in to satellite TV to catch up on what had been going on at the A1 Ring. Everyone had an opinion on team orders and probably somewhere people ended up punching each other over the subject. In Monaco, like it or not, the fragility of Formula 1 success illustrated why Ferrari did as it did in Austria. Suddenly Michelin came up with a tire that left the Bridgestone boys and girls humbled and we had a Williams-BMW on pole position ” and by a decent margin as well. Monaco, they will tell you, is where a driver can make the difference but it certainly did not look that way on Saturday in Monte Carlo. Michael Schumacher was not on the pace and not even he could muscle his car around quickly enough to make it to the front of the grid. Montoya was on pole and David Coulthard was second fastest in his McLaren-Mercedes. They say that in Monaco 80% of the race is done in qualifying because overtaking is so difficult in the race and it was no wonder therefore that Montoya was delighted with the outcome. So too were the Williams engineers because Monaco is one place where horsepower is not that important and the handling of the car is a vital element of success. "There you go," said the Williams engineers (off the record). "We told you the chassis was not bad." "There you go," said the people at McLaren (off the record) "Look at what we can do when horsepower is not the issue." "There you go," said the people at Ferrari. "This is why we did what we had to do in Austria. When the package is not right we can be beaten." As is normal at Monaco there were cries about the problem of traffic, but no-one seemed to think it had made that much difference to the overall scheme of things. Coulthard might have got a little closer to Montoya than he managed but otherwise it was not an issue. Michael Schumacher seemed a little out of sorts all weekend. It must not be nice to be boo-ed by your fans who are gathered on the slopes of the hillside by the Grimaldi Palace. But being the professional that he is, he took it on the chin. "We kept saying that it can turn around very quickly," he said. "I think we can be reasonably competitive tomorrow and if not then we have to drive home and see how many points we can score." Not wishing to be nasty to Ferrari, one has to say that seeing someone else ahead was a massive boost for the whole of Formula 1 because five Michael Schumacher wins in six races and the World Cup soccer competition on the horizon had meant that interest in the sport had been waning. But suddenly the paddock was all a-buzz once again. It was clear that Michelin had the advantage and given the fact that by the end of qualifying eight of the top 10 were Michelin cars underlined that the tires are a key element in F1 this year. Formula 1 team bosses always bang on about success coming when all the elements of the technical package are in place and here was evidence of that. The top six slots on the grid featured the top three teams: Williams, McLaren, Ferrari, Williams, Ferrari, McLaren. They were all covered by less than a second. The performances were all solid although Kimi Raikkonen might have done better had he not cramped his own style by crashing heavily far too early in the sessions on Thursday. Renault Sport took advantage of Thursday to get a little publicity and Jarno Trulli spent a day being the hero but we knew from the rest of the time sheet that there was little that should be read into the results (apart from the fact that the Michelins were good). The Renaults ended up seventh and eighth on the grid with Trulli a little way clear of Jenson Button. Ninth and 10th were the two Toyotas, split by a smidgen which left Mika Salo ahead of Allan McNish. Giancarlo Fisichella was 11th in his Jordan-Honda and it was the Italian who led the class of hopefuls which consisted of assorted Arrows, Saubers, Jordans and BARs. Minardi looked quite useful and Mark Webber beat both Jaguars. Alex Yoong felt that he might have done the same if he had not crashed at the first corner of his first flying lap. Down in the Minardi pit they could have put a frying pan on top of Paul Stoddart's head and an egg would have fried in it. Qualifying and racing are, of course, different things but at Monaco overtaking is really tough unless you have a considerable advantage over the opposition. Michael Schumacher may be a towering talent on the streets of that city that he used to call home but Montoya is no slouch on the streets either. In his career he has won at Long Beach and on the streets of Vancouver. 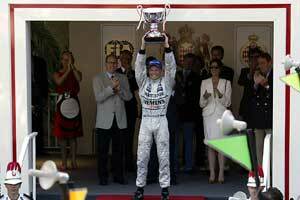 He has twice won the Grand Prix de Pau, an achievement which is unrivalled in the last 15 years. So he was going to be very hard to beat on Sunday. Prior to Monaco a lot of drivers had predicted that there would be another Ferrari whitewash (or perhaps redwash is a better word) but here we had a most unusual front row. "Racing drivers have balls," said David Coulthard when asked to explain. "But none of them are crystal. We are not very good at seeing what the future is going to bring." But Montoya did not give way. "It was quite entertaining to watch Juan," Michael said later. "He was clipping a few barriers, locking up, going sideways. He was overdriving a bit. Sometimes I thought that he was going to hit something and if I was staying too close to him it could be a problem, so I didn't. But he kept his concentration." Montoya would probably have pitted around lap 50 but on lap 47 the engine lost power, white smoke belched from the back of the car and that was the end of it. Michael made up for the ground that had been lost and for the last third of the race he sat on David's tail but there was nothing he could do to pass the Scotsman. David did not put a foot wrong all afternoon. There had been some worries earlier in the race that the McLaren's Mercedes engine would not last. On lap 30 the car began to smoke from time to time. But it did not blow and the Mercedes engineers were able to trace the problem to an oil transfer valve. This was not functioning properly but using the team's telemetry systems the valve activation could be fixed and the problem went away. David's race was a very good one ” and he knew it. "I'm so pleased," he said. "We have had a difficult start to the season and everybody has been working extremely hard. I was giving 100 percent all the time. This track is so unforgiving." Afterwards the McLaren men were quick to point out that this is not likely to be the start of a major McLaren revival. The team has a limited number of chances to win races this year, given the current package, and it intends to make the most of them. Monaco was the first and the team delivered. It was a great effort and the men from Woking were justifiably proud of what they had achieved. "This demonstrates the depth and commitment we have to winning," said Ron Dennis. There might have been more points for Kimi Raikkonen had it not been for the young Finn being hit from behind by Barrichello when he was running sixth on lap 40. Barrichello reckoned that Raikkonen had shut the door on him but the TV cameras suggested (as did Kimi) that Barrichello had simply made a mistake and driven into the back of him. Both cars pitted and while Rubens was able to get going again Raikkonen's car was examined and then repaired. The rear wing was replaced and he was eventually sent out again but after one exploratory lap he called it a day. There was no point in going on and taking risks. Neither Barrichello nor Raikkonen were really in the picture for a podium finish, even before their accident, as they were running around fighting for sixth place behind Ralf Schumacher in the second Williams-BMW and Jarno Trulli in his Renault. Ralf's race was pretty dull. He started fourth and moved to third when Montoya retired. He was never really a threat to Michael but was way clear of Trulli. Ralf described the car as "reasonable" but reckoned it was not quick enough to win the race. Tire wear was more than he had expected it would be and so Ralf pitted on lap 50 and then a few laps later he was back in the pits again when his left rear delaminated. The tire war is forcing the two companies to go softer and softer on their rubber and that means that at places like Monaco where it is an advantage to stay out as long as possible there is a danger that the tires will wear out. It was not the only tire to come apart during the weekend: Button suffered one such failure in practice and in the race Ralf, Mika Salo and Mark Webber all suffered similar troubles. Having been humbled in qualifying, Bridgestone ended the day convinced that its tire choice had been quick enough to win. "Our top cars clearly had more pace but we were unable to take advantage of it because of the difficulty of overtaking at Monaco," said Bridgestone's Hisao Suganuma. This was a valid point because when they were free and running Barrichello and Schumacher were able to record some very fast laps, which were a second faster than anyone else could manage. Coulthard's best lap was only the fourth fastest of the race. The three were split by Giancarlo Fisichella's Jordan-Honda which was there at the end of the race again in fifth place, just behind Trulli's Renault. Jarno made a good start and jumped from seventh on the grid to fifth. And there he stayed until Montoya retired. This moved him to fourth and he was able to hold off Fisichella in the closing laps. Button's race was not a good one. He jumped the start and then lifted off and dropped to the back of the field because of the way in which the software is configured. He was then given a drive-through penalty and by the time all of this had happened he was down in 21st place. He tried to work his way up the order but on lap 52 he collided with Olivier Panis at Ste Devote and that was the end of the story. Fisichella was quite lucky to get to the flag in that his team mate Takuma Sato very nearly had him off for the second time this year. Fisichella got in a bit of a tangle while trying to take advantage of an early overtaking maneuver which Frentzen pulled on Mika Salo on lap 19. But he had to brake and lost momentum and so Sato went ahead. It soon became clear that Fisichella was faster and the team asked Takuma to move over. This he tried to do in the tunnel on lap 23. "While I was trying to make space for him I picked up dust, slid and lost control of the car." The wrecked car bounced off the wall into Fisichella's path. He dodged to avoid it but then the wreck came back across the road again and Fisichella had to change direction again. But he made it through and went on to produce a second sensible result for Jordan. There was a close finish as well for sixth place with Frentzen holding off Barrichello. Both men had disrupted races, Rubens with his crash with Raikkonen and Frentzen thanks to a refuelling malfunction which meant that he had to do two pit stops. It was nonetheless a strong result for Arrows. Bernoldi's weekend was less successful (as usual) and in the course of the afternoon he was punted off by Felipe Massa as the two men fought over 12th place on lap 28. They got going again but Massa was then penalized by the stewards for causing the crash. He ended the day with a rear brake failure and a huge crash into the barriers at Ste Devote. The angle and speed of impact were frightening but Massa emerged unhurt. "It was a big impact" he said. There was not much more to report except to say that Webber did a good sound job for Minardi but a tire problem left him 11th. Toyota also failed to finish either car which was a shame. McNish made a mistake early on and hit the wall at Ste Devote while Salo suffered a brake failure at the top of the hill and bounced off into the barriers. Of Jaguars and BARs it is probably best not to comment. Overall, a good weekend for the sport after a period when things have not been looking too positive.